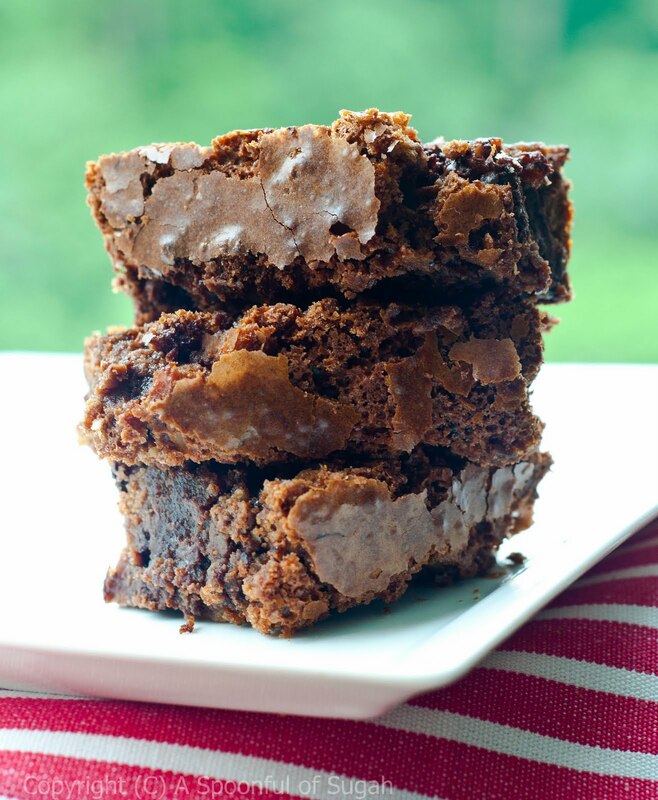 a spoonful of sugah: BROWNIE KNOCKOUT! Few questions will generate such varied and passionate responses as "How do you like your brownies? ", as I discovered last week in an informal Facebook survey. Some like it chewy, some like it fudgey (but almost none like it cakey). Some like it plain, while others preferred fillings ranging from nuts (pecans, macadamias, walnuts, hazelnuts, pistachios), marshmallows, chocolate chips, to raisins. I had taken it upon myself to make brownies for 2 parties, and even though I knew I couldn't please everyone, I was psyched enough by the challenge to try. But how? Many are the claims among published and unpublished chefs to the recipe for the "Ultimate Brownie", or the "Best Brownie in the World", and I had a difficult task trying to decide which recipes to use. In the end, it came down to 2 recipes, and 3 different batches of brownies. The first, a Double Chocolate Mocha Brownie. Crunchy on the outside, and chewy on the inside, with a strong coffee flavour, and studded with chocolate chips, pecans and macadamias, this is what I imagined a 'Wall Street' Brownie would taste like, and was indeed Sugahdaddy's favourite. 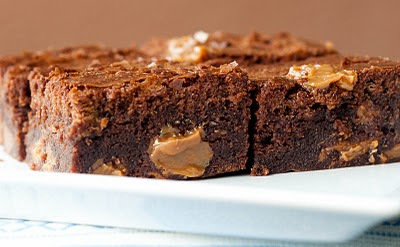 If you are looking for a robust, grown-up brownie with a definite bite, this recipe from Gourmet will not disappoint. The bittersweet intensity of the Valrhona Equatoriale 55% Dark Chocolate and Italian expresso packs a punch, which was no less diminished when served with a scoop of vanilla. Deeply chocolately, with a slightly crunchy crust and an interior that achieves that beautiful balance between chewy and fudgey, Nick Malgieri's recipe is not called Supernatural Brownies without reason. This version was made to please those of my friends who preferred their brownies sans nuts. I couldn't quite shake the feeling that a nut-less brownie was a little sad, and decided to drop generous gobs of Dulce de Leche in the brownie batter to liven it up (following the suggestion of my favourite food blogger and cookbook author David Leibovitz). Dulce de leche is the Spanish name for what is basically milk caramel. I love caramel of any kind, and the best part about dulce de leche (apart from how its sensuously delicious it sounds) is that you can make it very easily at home. All you need to do is to boil an unopened can of condensed milk in a pressure cooker for 30 - 45 minutes, and you will end up with this lovely caramel at the end. (Alternatively, you can cook it in the oven like Leibovitz suggests here.) I boiled my can of condensed milk for the full 45 minutes, so as to get this gorgeously smooth, dark brown toffee. I liked how its creamy sweetness balanced out the dark chocolate and added interest to the otherwise plain brownie. By the time I got to the third batch of brownies, I decided I wanted to stick to Malgieri's recipe. The original contender, Barefoot Contessa's Outrageous Brownies recipe, apart from the fact that it also contained coffee, would yield too many brownies for that recipe size. Besides, as I said, I really liked the texture of those Supernatural Brownies. And so, the Gone Nuts! Brownie was born. Deliciously chocolately and pleasantly (but not overly) sweet, this was made with a mix of dark chocolate and milk chocolate in a 3:1 proportion (Varhona's Equatoriale 55% and Valrhona Jivara Lactee 40%). I went crazy and filled it with 4 different nuts - macadamias, pecans, hazelnuts and walnuts - giving this fudgey brownie a satisfying crunch. 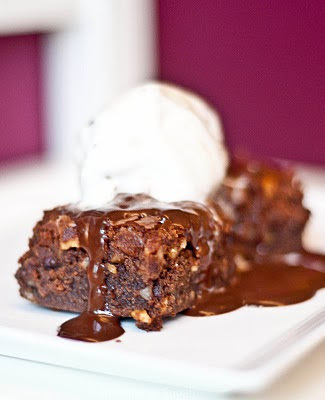 This brownie is my favourite, not least because I am such a nut lover. Served warm, with a scoop of vanilla ice cream and a generous pouring of Dark Chocolate Sauce with Rum, this was irresistable and especially difficult to defend from the Sugababes during the photo shoot. Oh shoot, I guess I'll just let her have her have it then. Initially, it looked like the men favoured the Mocha Brownies, as they all seemed to gravitate toward getting a caffeine fix after dinner. Comments pointed out that they were not too sweet and went very well with the ice cream and chocolate sauce. But then, equal votes started coming in for the Dulce de Leche Brownies and the Gone Nuts! Brownies, as they all started to disappear at a more even pace. I then realised that the fans of the Mocha Brownies were not so much dessert fans as a whole. In the end, the clear winner was the Dulce de Leche Brownies, with the pace of consumption outstripping the others by a clear margin. What can I say - even adults can appreciate a sugar high. So there you have it. Somewhere between those 3 versions, I thought my mission was accomplished and that I had managed to find THE Ultimate Brownie. For about a minute. I am DROOLING. 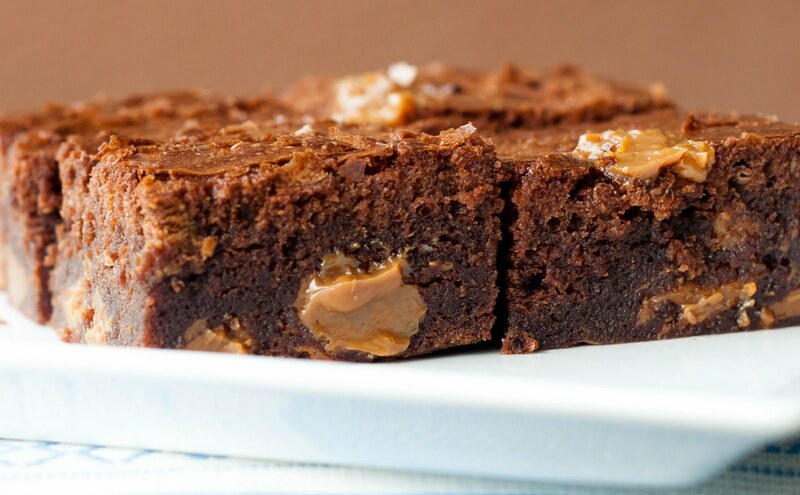 Can you courier the dulche de leche brownies to London? Plsthx. A dulce de leche brownie is outrageous. 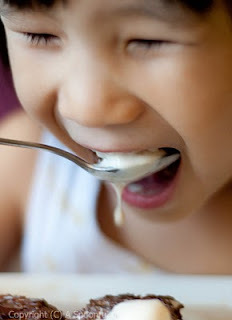 I am in love with dulce de leche! What an awesome idea!